Two cartoonists walk into a bar — No, wait . . . 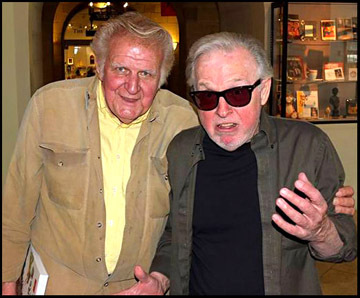 When two cartoonists, Bob Weber, Sr., (on the left) based in Westport, Connecticut — and Jim Sizemore (me), on the right, based in Baltimore, Maryland — meet for a “bro-date,” what do we decide to do for fun? Drink? Nope, we’re both too old and wobbly for that, so scratch an extended saloon visit. Chase women? Once again, bad idea and for the same reason. Mud wrestle? Naw, I don’t think so. I’m three years younger than Bob, but I’m sure he can still take me. But for old guys, we are pretty busy. 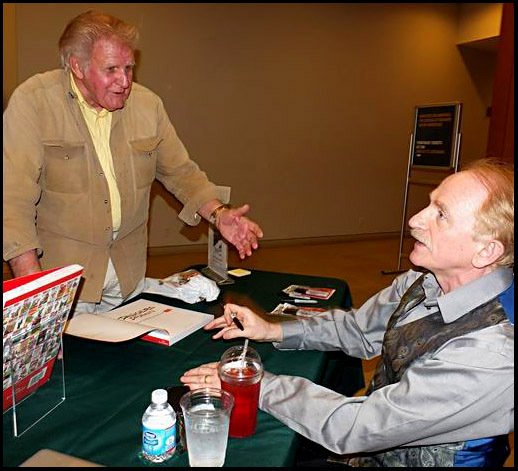 Since 1965, seven days a week, Bob has drawn Moose & Molly, a nationally syndicated comic strip; and with his son, Bob Weber, Jr., he produces the kid’s comic activity feature, Slylock Fox, both distributed by King Features. While Bob is a big-time syndicate guy, I do magazine-style “gag” cartoons, marketed to print and web publications around the world by the London-based outfits known as CartoonStock.com and Jantoo.com. I also take on the occasional freelance humorous illustration project — a recent example being eleven images for a National Parks Service “Jr. Rangers” booklet at Fort McHenry. So when Bob, who has lived and worked for many years in “Westpork” (as he likes to call it), shows up in his hometown of Baltimore, we usually try to get together for dinner. This trip — on May 11, 2013 — he had a different goal. 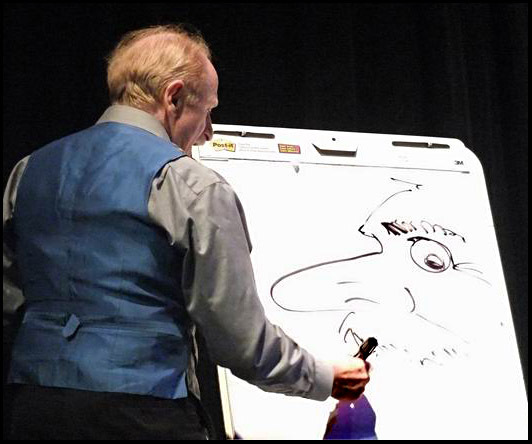 Bob came down to attend a presentation by the internationally known, and locally based, editorial cartoonist, Kevin “Kal” Kallaugher. 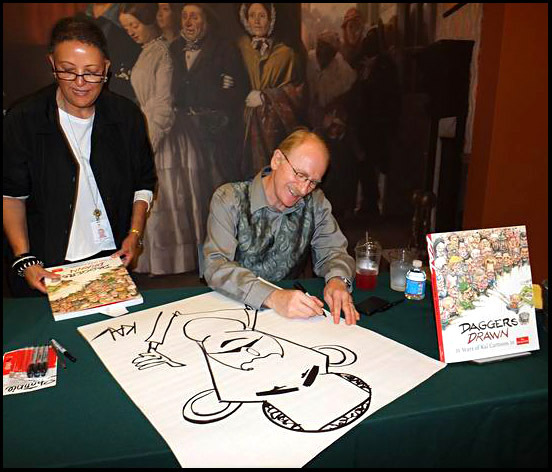 Kal has drawn his famous caricatures for The Economist magazine and the Baltimore Sun for over 35 years, and he had scheduled a multi-media book-launch extravaganza at the Walters Art Museum. Bob was keen to attend, asked me if I’d like to tag along, and I was happy to. So, what do old cartoonists do for fun when they get together? Why, whenever possible, they try to hookup with another cartoonist! 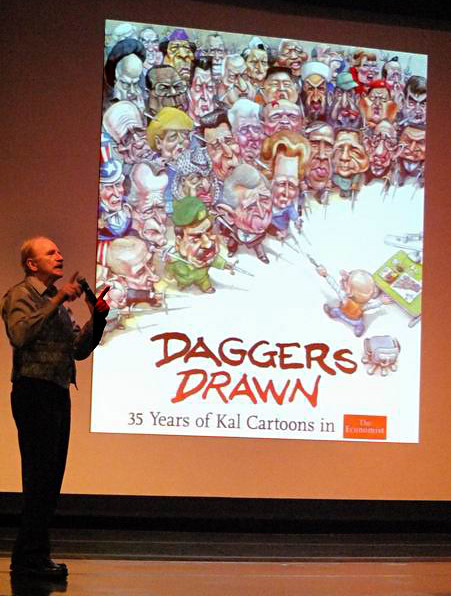 Kal began the presentation by talking at some length about his new cartoon collection titled, Daggers Drawn, all of the images done for The Economist. He said he got his big break there as a result of doing caricatures of people on the streets of London, and showed a slide of the cover of the book. He also promised that at the end of the show he’d teach us — the entire audience of over 100 — to caricature President Obama. (By the way, how many of the book cover caricatures can you can name? Before our turn came to show our stuff, Kal did a self-caricature. That’s him all right! Another fun example. 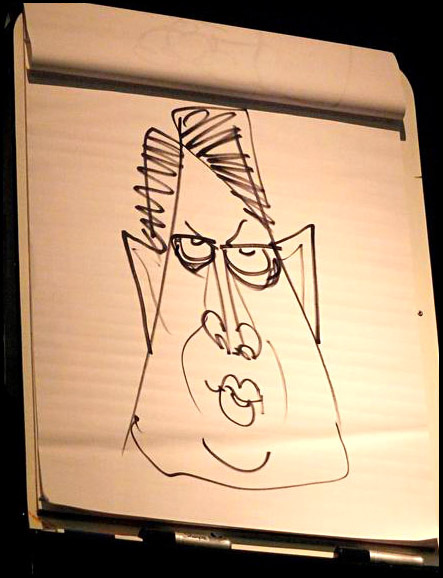 Kal began his John Kerry caricature with a very long chin-shape, then “realized” that it was by no means long enough, and proceeded to tear off the flip chart page and stick it on the bottom of a clean sheet of paper. Then, with a few more deft lines, he produced the clever drawing you see here. Now that big finish: Kal’s demonstration showing how we can all “do” President Obama in 10 easy steps. Below I’ve tried to recreate his process, more or less . . .
1) Kal directed that we draw a large “C”shape at the top of the page, turned on its side with the open part down. 2) Then add a long interior horizontal line, and two short vertical lines, to reinforce the top and sides of what will be the skull; and fill the spaces those two actions create with squiggly lines to indicate hair. 3) Next, place two short angled lines jutting off either side of the skull, then continue downward with two long inward slanting lines for the sides of the face. 4) Back up top, outside where the skull ends and the face lines begin — on both sides — place nested “C” shapes for ears. 5) In the middle of the interior face space, give him two dots for eyes. 6) Above the eyes, add several lines close together to suggest very bushy eyebrows. 7) Below the eyes, about half way down the face, draw a series of three large, connected, open-topped “O’s,” with the middle one bigger than the other two, to form the nose; then place a small open Obama “O” just under the nose. 8) Below that, add a stretched out “M” shape, enclosed with a horizontal line and filled in to make the upper lip; then a stretched out “U” shape under that for the bottom lip. 9) At the bottom of the face shape, add another — smaller —horizontal upside-down “C” to make the Obama chin. 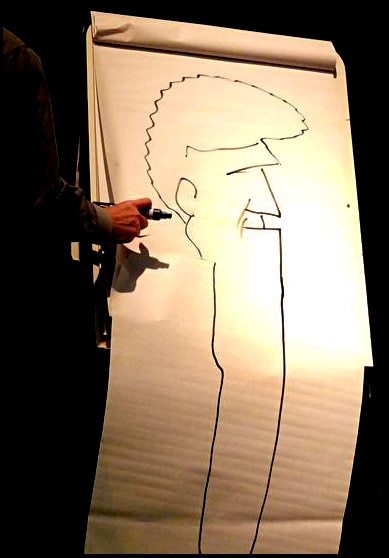 10) To finish our Obama caricature, Kal had us begin at each side of the nose and draw long parentheses lines that extend all the way down to the chin. Kal writing a dedication on the Obama caricature he did on stage during the presentation. 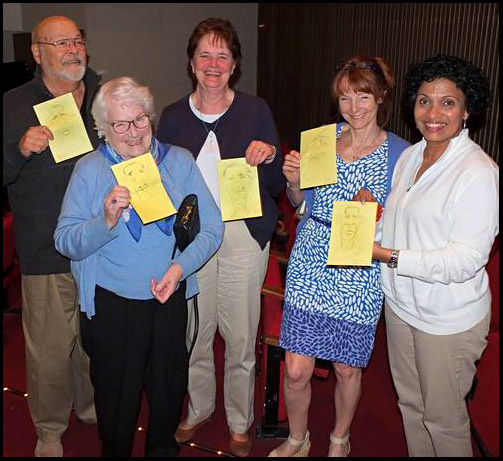 Select members of the audience, including Kal’s mother and wife — both in blue — showing off their Obama caricatures. Darrenn E. Canton, a young illustrator from the Washington, D. C. area, with portfolio. 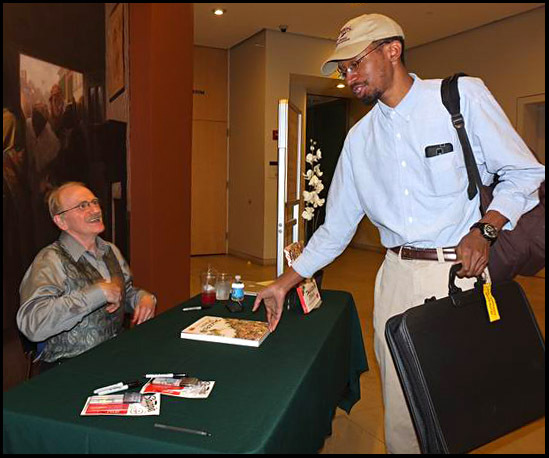 He waited patiently at the end of the book-signing line in order to have an extended chat with Kal. In this photo Bob Weber, Sr. is either telling Kal a joke, or suggesting how to improve his presentation — or, knowing Bob as I do — more than likely both . . .
To order Kal’s new book, click on his name in the sidebar links. All photographs in this post © 2013, Bruce Guthrie. This entry was posted on Wednesday, June 5th, 2013 at 4:55 am and is filed under caricature, cartooning, composition, doodles, drawing, humor, illustration, images, Obama caricature, teaching. You can follow any responses to this entry through the RSS 2.0 feed. You can leave a response, or trackback from your own site.